Heat the oil in a large frying pan over high heat. Add the bacon and cook for 2 minutes. Add the mushroom, thyme, garlic, salt and pepper and cook, stirring, for 6–8 minutes or until the mushrooms are golden. Cook the pasta in a large saucepan of salted boiling water for 6–8 minutes or until al dente. While the pasta is cooking, place the egg yolks, cream and parmesan in a bowl and whisk to combine. Drain the pasta, reserving ½ cup (125ml) of the cooking liquid. Return the pasta to the saucepan, off the heat. Add the reserved cooking liquid and the cream mixture and toss to combine. 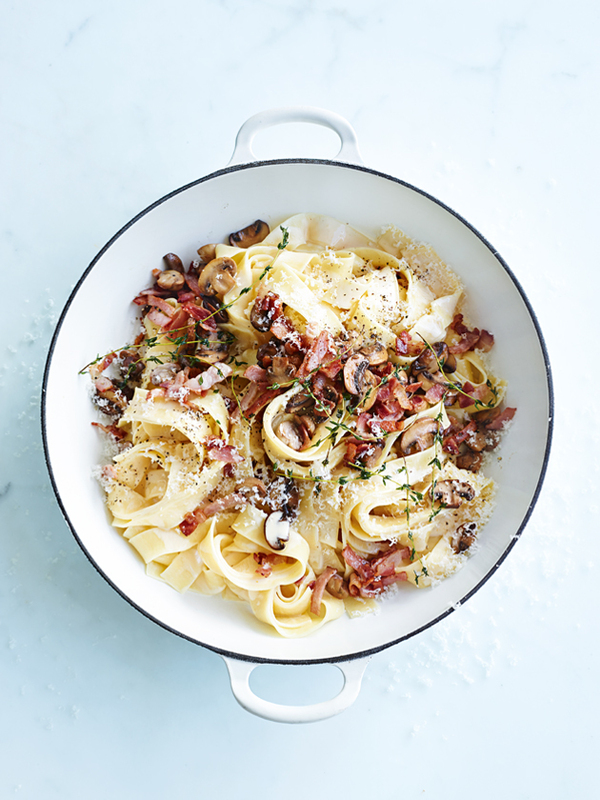 Divide the pasta between bowls, top with the mushroom mixture, pepper and extra parmesan to serve. Serves 4.